The Russian government is looking to pass a measure that would ban American journalists from accessing the lower chamber of its Parliament, the Duma. 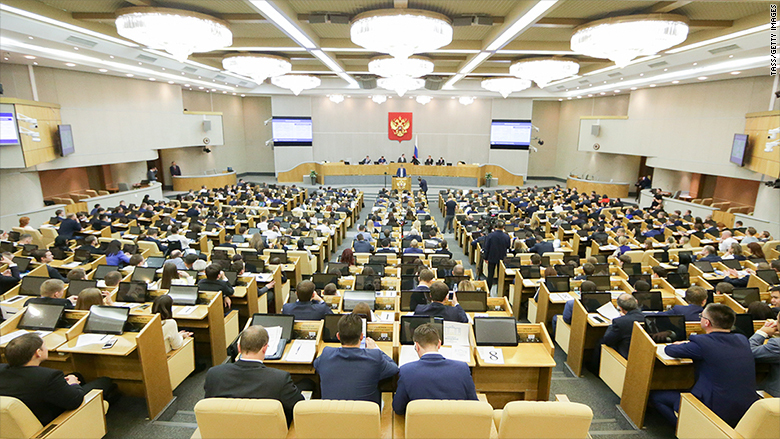 The Duma will consider the resolution next week, Olga Savastyanova, head of the Duma's lower chamber's committee on regulations and control, told the state news wire RIA. It will need to go through several steps, including being passed by committee, the upper house and the lower house before the resolution becomes official. Russian President Vladimir Putin's spokesman, Dmitry Peskov, said on Friday the plan to ban American journalists from the lower house of the Russian parliament has the Kremlin's "full understanding." Russian officials said the move is a direct response to the American arm of Russian television network RT losing its Congressional press credentials. In a letter addressed to T&R Productions LLC, the production company behind RT America, on Wednesday, the Executive Committee of the Congressional Radio & Television Correspondents' Galleries said that its members had voted unanimously to withdraw RT's credentials after the company was forced by the Justice Department to register as a foreign agent earlier this month. Though RT reporters may still access the same areas of the Capitol as the general public, they will lose special access granted to secure areas of Capitol Hill where reporters often speak to members of Congress, like the Speaker's lobby and press galleries. "Such blatant attacks against foreign media, particularly Russian ones -- which are in violation of the world practice of freedom of speech -- they, unfortunately, are blossoming in the US," Peskov said. The ban is the latest in a series of escalating restrictions the Russians are placing on some American media in response to American scrutiny on Russian state-funded outlets RT and Sputnik. RT was singled out in a intelligence community report published in January on Russia's attempts to influence the 2016 U.S. election. RT had initially skipped an October deadline set by the Justice Department for it to register as a foreign agent in an attempt to fight against doing so. T&R Productions LLC relented and filed as a foreign agent with the Department of Justice on November 10. Russian President Vladimir Putin signed amendments into law this past weekend that will allow foreign media outlets in Russia to be listed as "foreign agents." Russian officials have said the move is a retaliatory response to the U.S. government forcing RT to register under FARA. -- CNN's Clare Sebastian contributed to this report from Moscow.